Astu's science blog | About science, its happenings and the links with our world. The last year, and the beginning of 2011, has been full of projects, work and other stuff. All this had me away from the blog. As a scientist, sometimes things get really hard to maintain in a specific way. And the blog is the downfall of all the work that I have been doing lately. For example, here in Chile, the spring (starting in September) becomes THE season of meetings and events. In october, I had the pleasure to participate in the European Wnt Meeting, held on the Karolinska Institutet, Stockholm. Back at home, I had now the opportunity to attend the 5th meeting of the Latin American Society of Developmental Biology (LASDB), featuring important scientists from all the world. It was an incredible experience, to participate in both events. But, as many of you probably know, you come back from these events with your head full of ideas. Translating those into a planned experiment, testing the conditions and getting results can take a lot of time. And I am still in that process. I proposed to an Association of Researchers in Graduate Level” (sort of translation), an idea to promote science in the people, to reach authorities and to promote science in the media, among other things. This campaign has been difficult to develop. The lack of funding, and contacts outside the science world, makes this advocacy campaign an “impossible” plan. I really admire the strength of the “Science is Vital” initiative. But we are far from that success and resources. I collaborated with some posts on The Node, the more-than-awesome blog and community around the Development journal. I also published some letters in chilean newspapers, about the state of Science in our country. These media included El Mostrador (the first and most important digital newspaper), letters in La Tercera and El Mercurio (the two most prominent printed newspaper), and others. It has been interesting. All this work. But I believe that, this year, I will come back to my roots at Astu’s Science Blog. But excluding more discussions regarding Mendeley, Papers and related software. Science life or, more exactly, scientist life, will be my most common topic this year (I hope). Well… This is my first post written from my iPad. I have been a little dissapeared from the blog lately. The last three months have been crazy: I had to go to an european meeting in Sweden (which means, exactly, to fly from the other end of the world), then back to help in the development of an international course on regeneration, then going to another international meeting, in Chile this time, then back to the lab to planning new experiments and discuss ideas with my PI, adding the comments of other researchers gathered in the two meetings, and writing some stuff for an advocacy project and also writing some post for the outstanding The Node. After all this work, I am tired. Obviously. It is hard when you don’t see a reward for your efforts. Only a few comments in my posts regarding the “Paper versus Mendeley” battle keep this blog alive; I am pretty sure that, if I send to the trash those posts, the visits will drop to zero. I am also thinking that the advocacy project will fail, mainly becausethe lack of energy of chilean scientists to fight to change the awful scenario for science funding amd science policy. I like to write, but writing without knowing if someone is reading your work is just dissapointing. I have to manage todo all these things in a pretty much demanding lab (my PI has great expectations in his graduate students, and he also likes having his students 24/7 in the lab), and also I have a family life, and doing this stuff implies less time with them. So, I decided to leave the blog unattended for some weeks. For those of you following the “Papers versus Mendeley” issue, I have news indeed: I wrote about Mendeley for iPad. I could not keep using Mendeley: it crashes, it is slow, downloading one paper at the time from my online account and many other little details pushed me to test Papers for iPad. And it really rocks! I will not make a review of Papers for iPad. Just use it. I believe that the iPad is one of the best news for scientists. To date, I am saving paper because I read papers only on the iPad; I give presentations with the iPad, and many other things too. The only feature missing in iPad (that makes me to not saying that the iPad is perfect for scientists) is the ability to incorporate error bars in charts. Anyway, I need to sleep now. Best regards. I am back in Chile. I went to the European WNT2010 Meeting, held at the Karolinska Institutet, Sweden. It was a very wonderful meeting, specially to me. I don’t have so often the opportunity to go to another far country, and share my results with the authors of the papers I usually read. It is a great time also to learn, the new techniques, theories and trends in the field. 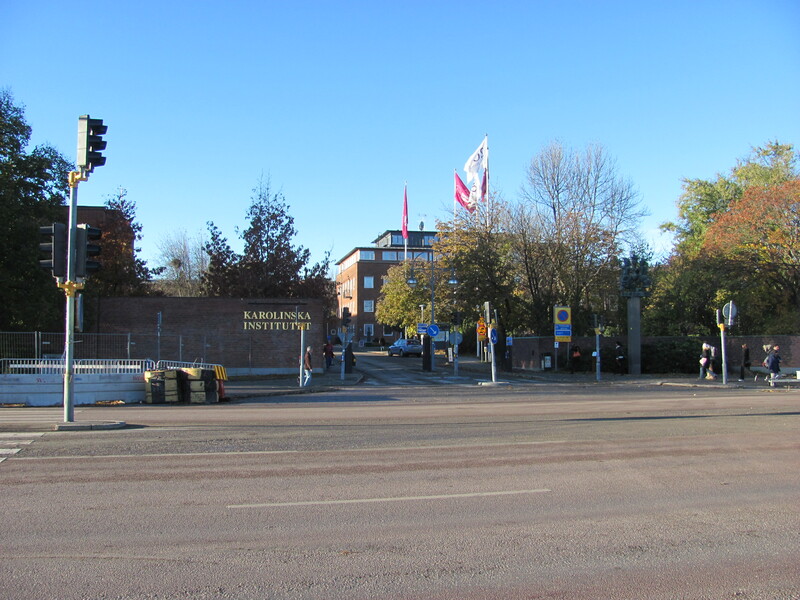 Main entrance to the Karolinska Institutet at Solna, Stockholm, Sweden. And giving a presentation with the iPad is very nice. You will have a black screen showing the slide number (as far as I can remember… I was a little nervous), and the keynote presentations displays very well in the big screen. Also, if you forget your laser pointer, you have an option in the iPad: you keep pressed your finger in the screen, and a point very similar to a laser point will show up in the screen. You have to keep pressed your finger, and you can move across the screen to move the pointer. Now we have another interesting meeting here in Chile: the meeting from the Latin American Society of Developmental Biology (http://www.lasdb2010.com/, if you can review the program). I will be out some time until the “meeting season” ends. Best regards. If you are a scientist doing your PhD, or at the beginning of a postdoctoral position, or if you have a family (and so on) you will find with little time to learn and investigate deeply enough before to make a decision about purchasing an iPad and taking it to the lab. Searching for experiences with iPad’s users in research is a good start. It worked a little for me. And I promised myself to keep people updated about my experience with iPad in research. Useful or useless? Free or Paid’s apps? iWork or DocsToGo? 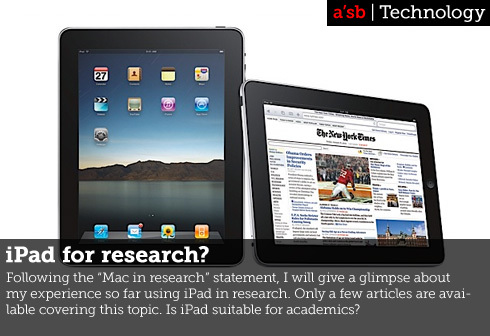 With some weeks of use, I will give you some personal advice and comments about iPad in research. iPad in Research: comments and advice. 1. Maybe, the first statement, is the following: iPad will change your life. Absolutely. For the basics, at least. I remember when I went once to a meeting with my old laptop, weighting almost 3 kilograms. It was awful. With the iPad, you will have a light device to check your email, send emails, reading papers, searching Pubmed, reading Nature/Science, reading a manuscript… I find myself lately going with the iPad to bed to read some paper. You will find yourself replacing the heavy laptop with the iPad to check your email, and reading papers. It’s just great for this basics. Your back will be happy when going to meetings. 2. Being said that, the iPad is not suitable to create scientific material. This only point makes the purchase of an iPad not worthwhile if you want to replace your laptop for scientific needs. Here I will tell you 3 key points. b) If that was not enough reason, here is the second big problem. You can’t create charts with error bars! This one is really painful. This means two things, my fellow researcher: you can’t create scientific charts on the go, which will push you back to the laptop to analyze and plot data; and second, you can’t view charts with error bars in Keynote! One of the best things about Keynote for research in Mac is the ability to copy a chart from Numbers, and modifying the size, colors, and other features in Keynote without the need of opening Numbers over and over (I remember trying to change the font size in a chart in Powerpoint, and waiting for Excel to open, closing the window, waiting that the expected change was good enough… with iWork you can forget about that old “Window’s pain”). But with iPad, you will need to export the charts as images (again, PNG format) and inserting them in the presentations, which is a sort of “what’s the point in having iWork if it will function as an office from the 2000 year”. Apple: you really need to fix this if you want to have the iPad going massively into the laboratories. c) At this point, the lack of multitasking makes difficult to use iPad for serious scientific work. Also, Apple needs to work on big improvements on Safari for iPad (for example, allowing the download of PDF files -a.k.a. “papers” to us). 3. Nonetheless, the iPad is still very useful to daily needs. I read journals in the iPad (although you can’t save PDF from Safari… your best shot is having a PDF reader with a built-in browser), check my email, and carrying my presentations (I had to fix all of them). Also, if you are a traveller, you will have many apps useful for you. 4. About apps: Many apps are available to scientists. Periodic table of elements, some biological apps, even the “iPathways” (which you can use to read molecular pathways in SBML language) are available. Maybe the most important choice is what software you will use to manage your scientific papers. Before the iPad, I was a strong follower of Papers for Mac. I had many, many, many reasons to choose Papers over Mendeley. But now, I am slowly changing to Mendeley. Why? For many reasons. First, Mendeley (a “lite” version, tough) is free, and Papers exist as a “paid” version only. You will pay for a version that makes almost the same that the free Mendeley, except for highlighting. But, what’s the point on paying for highlight papers if you will not be able to export those annotations and highlights to your Mac?! Besides, what happens if you are a Windows user? In that case Mendeley is your “only” option. I see a near future where people will change to Mendeley. Half of the iPad’s users are Windows users, so they will use Mendeley soon. The other half, the Mac user, will think: “Well… I paid for the desktop version of Papers… Do I have to pay again for the iPad version (a high price, compared to other PDF readers apps with highlighting and annotation features), considering that I can export my entire library to a free account on Mendeley online and having a “lite”, free version of Mendeley?” Of course, this will change as soon as Mendeley releases a paid version (the called “Mendeley Pro“?). Then the real battle will begin. So far, I think Mendeley Lite for iPad covers most of my needs. I have to make a workaround to use it: exporting a custom collection in Papers (which I called “iPad”, jejeje) as a bib file; opening this collection in Mendeley, choosing to sync the PDF files linked to this collection onto my online account, and downloading those PDF onto Mendeley on iPad. But hey, I am already making worst workarounds to carry on my presentations. As a normal user, I find iPad a life-changing. Really. But, as a scientists, iPad still need some improvements. Being more specific, more suitable Apps are needed to the scientific community. Allowing the creation of scientific charts (with error bars! ), more flexibility in Keynote, and multitasking are extremely urgent needs. There is a niche in which companies can still work to gain more money and followers. For example, Papers could release a “lite” version of Papers for iPad, or maybe offering some kind of discount to the desktop users. Paying a total of $57 for the desktop+iPad combo, now with an improved (and improving every day), free Mendeley at $0? I would change now to Papers for iPad with a “lite” version. The scientific websites should also work on improving accessibility for iPad. For example, journals would release versions for iPad (and tablets) of their magazines. They would gain more subscriptions. There is a lot of potential on iPad in research. I recommend having an iPad for your normal needs, but I hope and wait for improvements in iWork and other Apps. One of the goals of this blog is to keep you posted with my experiences about Mac in research. A series of posts regarding bibliographic management have been very read and commented. I am still a big Papers user. I am still believe that Papers for Mac is way better than Mendeley, although I respect so much Mendeley because of its integration with web (and saving papers and reading them everywhere) and the online community and sharing capabilities (and, obviously, because it’s free). However, the future is here, and mobile devices are staying for long. The launch of iPad opened a new battlefield: which software would come to colonize iPad’s bibliographic management? And then, finally, I manage to have an iPad. I truly believe that the iPad can be useful for research. We need more time so the apps improve their evident flaws (for example, no error bars in Numbers?). But Papers and Mendeley were right there, ready for one more battle. Having paid for the Mac version, I would expect a more affordable iPad version for Papers’s current users. I don’t know if the App Store allows to make such a discount; nonetheless, having paid for the iPad, the case, the iWork suite, and some other necessary stuff, paying for Papers in iPad for now is out of options. So, I started to use Mendeley (despite that I hate Mendeley… in my iPod touch, Mendeley crashes often). But I am getting used to upload papers in my online account and then downloading them into iPad’s Mendeley. I can’t make annotations, I can’t search in search engines like in Papers but… when some folks have been working hard to keep an App free of charge, and when, in the other side, some folks decide to charge (reasonable, of course) for the iPad version even to current users from the desktop application, well… I remember when I lost my cell phone once. I went to the company’s office, thinking that I should pay for a new cell phone, and then the girl from the company told me that the phone was free of charge, because “to our company, our customers are important and we want to keep you with us for many years”. Scientists don’t make lots of money. In fact, US$15 here in my country are almost 5 times more expensive, if we consider the GDP per capita. I will end sooner or later buying the Papers for iPad, and maybe I will update this post. Until then, I think that, for now, Mendeley won the mobile war because, at the end, if you own an iPad, you will spend lots of money in many apps, cases, keyboards, and stuff, and every cent will count, specially in smaller (poor) countries. Chile is in front of one of the most important challenges in the next years: to deal with an increased demand of energy. Naturally, many options are proposed by different “players”. But two big forces are in the final battle. By one hand, one consortium is a big defender of hydroelectric power, installing several dams. 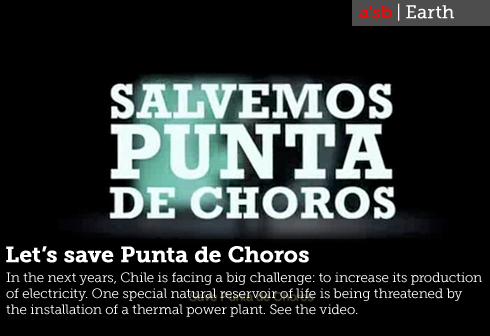 In second place, another group is claiming that nuclear energy is the only option for satisfy chile’s demand of energy. In the meanwhile, many small thermoelectric (gas, oil, or coal) power plants are being installed. One of them is placed near to a region known as “Punta de Choros”. The international audience is not aware of the upcoming damages that this power plant could do to this region. The following video (in spanish and with english subtitles) explain some of the probable damages. It is enough to say that Punta de Choros is an extremely important region for biologists and ecologists. It harbors important species and is a natural Marine reserve. A recent article in Science (Vol. 329, pp. 382-385) also reviews the proposed alternative to thermal and nuclear plants: flooding of valleys and rivers in the Patagonia, losing precious ecosystems and biodiversity. It is very dissapointing to see how chilean authorities don’t want to listen to scientists and engineering, and to see wind energy and other clean energies (such as solar) as a real option.